Hi everyone! In the new year I am searching for some new ideas for posts, and this is one I’ve come up with ‘Value Destinations’ – that’s places that I reckon represent a decent bang for your buck. Some places can be quite frustrating because money disappears at a rate if knots, your accommodation is a little more expensive than the last place you visited yet the quality of your stay is far less. So – what places have I been where I’ve been happily surprised by how affordable a place is. I’m starting today with Uzbekistan. After visiting Kazakhstan I was thinking that Central Asia was far more expensive that I had hoped. Kyrgyzstan proved to be much cheaper, and so did Uzbekistan. Uzbekistan is a special sort of country, mixing the Middle East with Central Asia and Russia all at once. The capital Tashkent was the most expensive place I visited. When I arrived I couldn’t get into my hostel of choice and it was already mid-evening so I contacted a place that had a room for $80 a night. 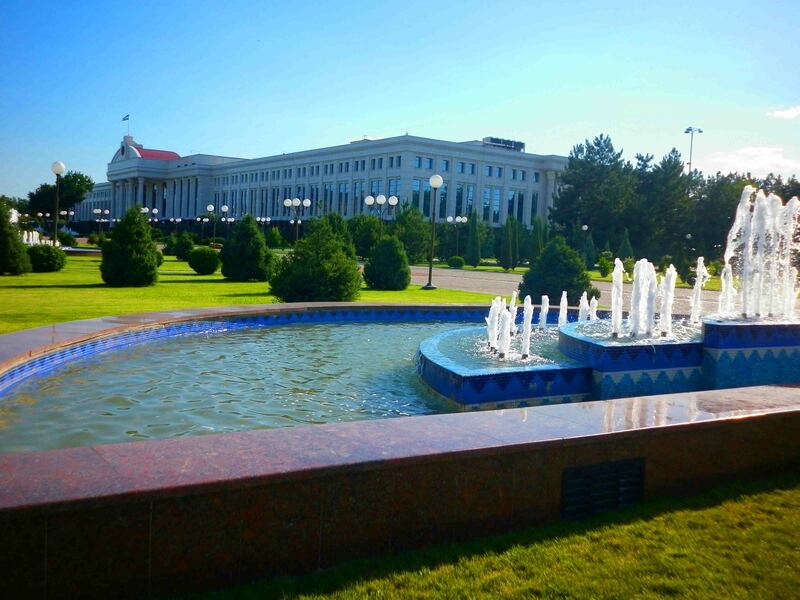 So warning – if you want a cheap place in Tashkent, places fill up quickly and there aren’t a lot of options, so get a confirmed booking in advance. The place I wanted to stay at and eventually did when I returned to Tashkent is the Gulnara Guest House. It’s good value – I paid $20 for a single room with shared bathroom. They had cheaper dorm beds as well. For around $15-$25 I could find really nice, comfortable single room. Okay, it’s not DIRT cheap, but some places you’ll find dorm beds and others you could even couch surf if it’s your goal to make your trip and cheap as possible. 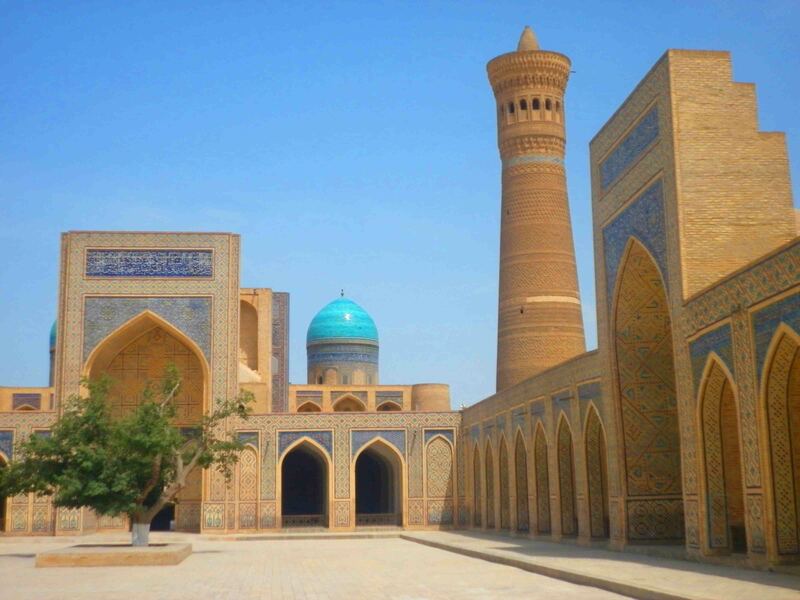 I went to the three most visited places in Uzbekistan – Tashkent, Bukhara and Samarkand. What’s there to see? Well, there’s heaps really. 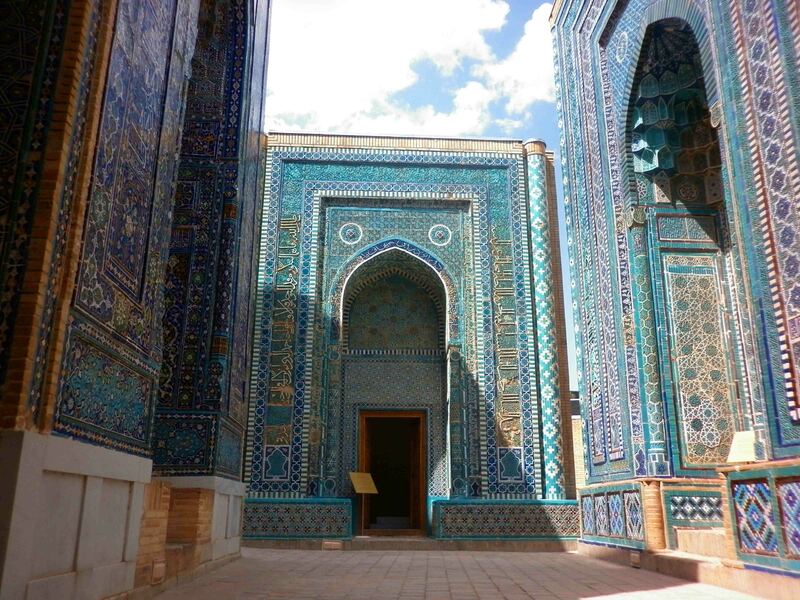 There are stunning mosques, citadels and in Samarkand some really amazing tombs. Some are free, most charge a few dollars to enter but rarely anything more than 3 bucks or so. 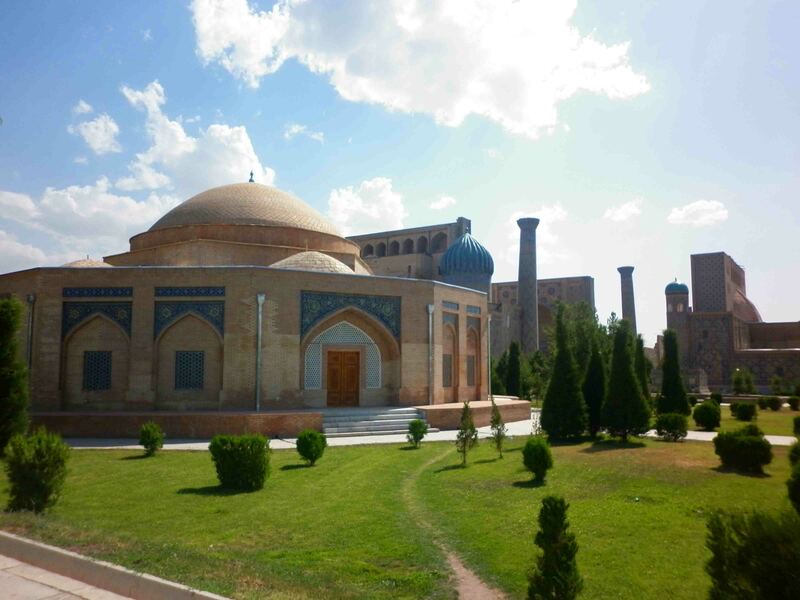 Samarkand probably has the most sites, but Bukhara is really charming and the most Middle Eastern of the three cities. Many of the Islamic buildings are very similar to that of Iran and parts of Pakistan (such as Uch Shariff) featuring a lot of blue in the amazing mosaics. Tashkent on the other hand is a grand city that feels quite large even though I didn’t get the sense that there were a lot of people living in it. 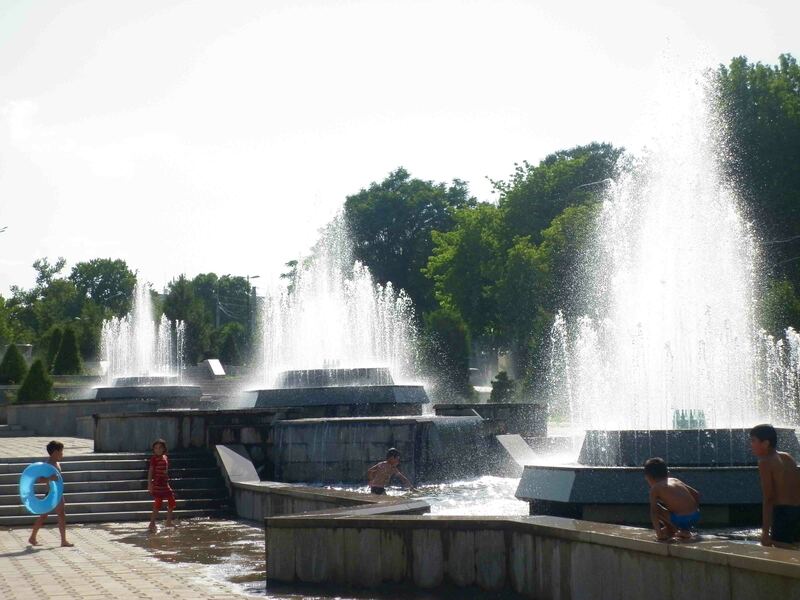 It has orthodox churches, theatres, museums all great value, and a number of very pleasant parks and interesting buildings and statues – all free to get your fill of! To keep my costs down I found I could walk to everywhere in Bukhara bar the train station, in Samarkand things were more spaced out but still walkable, and in Tashkent the metro was around a dollar I think and I did a fair bit of walking from there. 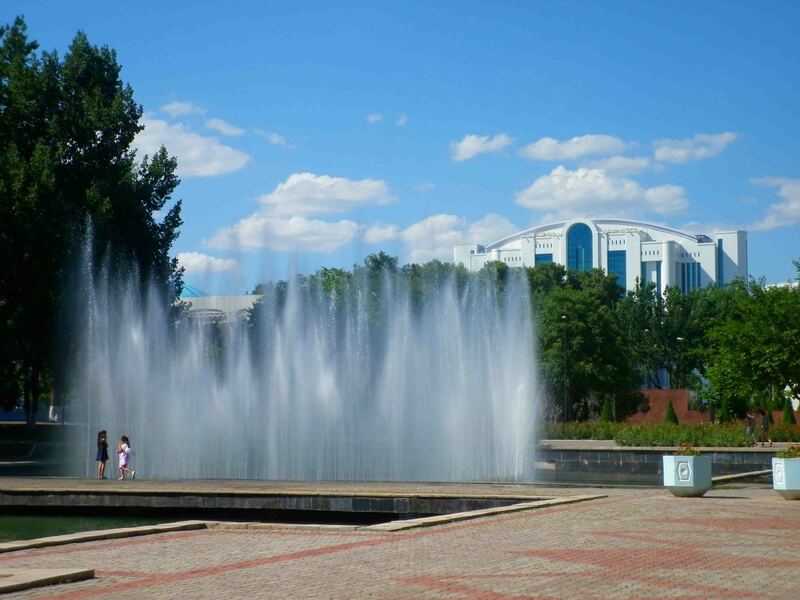 Fountains and parks abound in Tashkent. 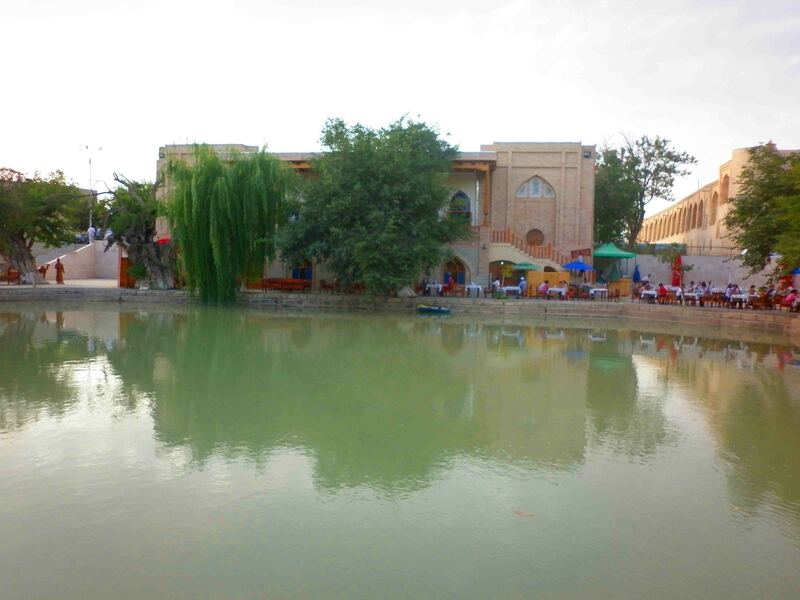 ‘Lake’ in the main square, Bukhara. Taxis, however are rarely more than a few bucks. Five dollars should get you quite a way around Tashkent. Between cities the train was a little more expensive, there are share taxis and buses though that will get you around with very little impact on your wallet. Flying in and out of Uzbekistan, however, is expensive. The cheapest flights I found from there were with budget airline Air Baltic. I got a one way ticket from Tashkent to London for about 180 Euro back in 2011. From Asia it’s pretty tricky to ANY country in Central Asia, rarely cheap. Your best bet might be China Southern or another Chinese airline. As for food, well, 2-3 bucks will get you a meal. 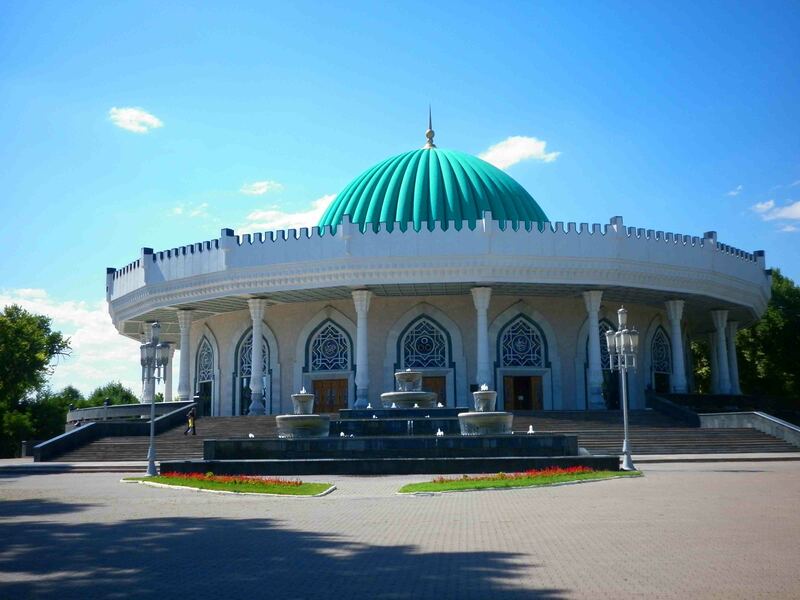 In Tashkent you can find supermarkets and Gulnara has some facilities for self-caterers. Get into the local dishes – plov for instance, an often quite delicious dish of rice, beans and meat popular throughout Central Asia. Take in the history, the culture, the warmth of the people and everything this country has to offer. Pair it with neighbouring Kyrgyzstan which is also pretty easy on the wallet. You’ll discover a rich tapestry of life in this part of the world. There’s no doubt in my mind, Uzbekistan is a brilliant destination for the self-sufficient backpacker. Flights and visas aside, I spent around $40 a day there. Couch surf or dorm bed it, you can make it cheaper still. That’s what makes Uzbekistan a ‘value’ destination. 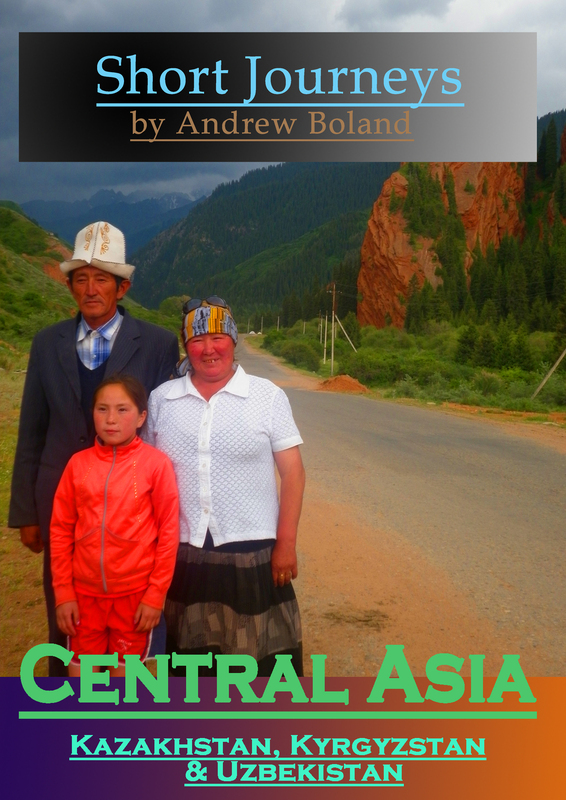 You will find more of my writings on Central Asia on my blog, or below – my Kindle ebook on Kazakhstan, Kyrgyzstan and Uzbekistan. That’s a nice idea to write about. Everybody wants to travel, but money is the only concern. Introducing destinations that offer cheap accommodation and other things should encourage people to travel more often. Congrats on the kindle book!! Looks a great place to visit – I admire you for visiting places that unusual – that makes your trips are special! Uzbekistan looks amazing! I’m in the process of applying for my LOI and can’t wait to visit it soon!